Rudy's taco truck aka Tacos Don Jorge is moving on up in the taco world to a brick and mortar taqueria. As Peter Griffen would say - Freakin' Sweet. My favorite westside taco truck is leaving behind the mobile taco world for greener pastures. 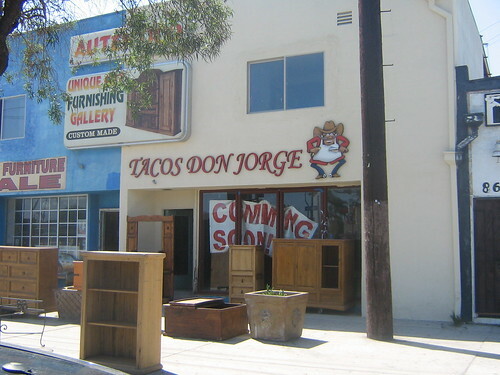 Good luck to Tacos Don Jorge! Stay tuned for news on the grand opening. It's worth noting that there's been a change of taco trucks at La Brea and Olympic. I was a big fan of El Pecas #2 (although apparently not a big enough fan to know exactly when they were replaced). Looking at the review of El Pecas, I'm beginning to wonder whether the new truck might just be a new paint job though... I don't think so, though, as these seemed even better than what I remembered from El Pecas. It's just a new paint job, Don. The employees are the same. The new name is "El Chato" and it has pictures of Cantinflas on the side. Awesome to see a new brick-and-mortar taqueria nearby. Perhaps I'll stop there sometime on the way to USC, grab some al pastor, and then hop on the #333 to take me to Venice/Hoover. Same truck at Olympic and La Brea. New paint. I was there on Saturday night after the "Sing Along Sound of Music". Two al pastor for me and a carne asada for the Little Woman. Tacos Don Jorge's burrito are the best everrr!!! Their home made "chimole" sause is like nothing I've ever tasted. Can't wait till they open up the new place!!! &in reply to David's comment, the restaurant's coming. It takes time openin a restaurant. But it's coming! THE RESTAURANT HAS OPENED &IT'S BEEN A HUGE SUCCESSSSS. COME OUT &ENJOY THE AMAZING FOOD.